Swakopmund — Lizelle van Wyk, a single mother of three from Walvis Bay, says that addiction to the cough syrup codeine is real as her 16-year-old son is currently battling to rid himself of the habit. She thus welcomes the government's decision that any codeine-laced medication will only be available with a doctor's prescription. "Yes it's a costly process now but think about the hundreds of children whose lives would have been destroyed by codeine addiction as it is a reality, especially at the coast," she said. Symptoms of codeine abuse will vary among users depending upon the amount used and the length of drug abuse, however signs to look out for are mood swings, drowsiness, increase in the amount of time sleeping, decreased appetite, constipation, seizures, respiratory depression, hallucinations, and lack of emotions, among others. Van Wyk, who is a businesswoman, says she got a rude awakening last year August when she discovered four empty cough syrup containers in her son's bedroom. "First I thought it was just a difficult cough that he can't get rid of, which he confirmed when I asked him about it," she said. She also did not notice anything wrong, as she had no previous experience with any sort of addiction. "Instead I went and bought him stronger cough syrup, not knowing that I was fuelling an addiction," she explained to New Era yesterday. According to Van Wyk, she one day caught her son and his friends in his room busy mixing cough syrup with cool drink. "I was shocked and confronted them... what they told me was shocking and it was happening right under my nose," she said. She says that she immediately sent the other boys home and consulted a close friend, who happens to be a doctor. "She told me everything about codeine and how it is found in cough syrup. She told me that it is called a purple drink that is very popular among teenagers." "Thankfully I found out and could deal with the addiction immediately. It cost counselling, tears and a lot of yelling but we are getting there. He is currently living with his grandparents as the battle continues," she said. "It's not completely over yet but we are getting there." "What worried me mostly is the fact that the codeine-laced cough syrup and painkillers could be easily accessed by teens," she added. Pharmacist and owner of Walvis Bay Sentrum Pharmacy, Hendrik van Schalkwyk, also told New Era that codeine addiction would have become a real problem if regulations were not enforced. "We had children coming in daily just for cough syrup. In the past it was difficult to control. As a result we had no choice but to keep a register at hand where anyone buying cough syrup containing codeine would sign [for it]," he said. 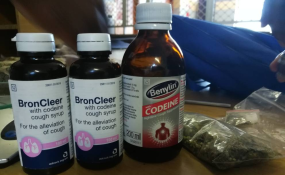 Van Schalkwyk also said they would monitor the register and anyone buying the codeine-containing syrup for a second time was then offered an alternative cough syrup without codeine. He says that in many cases the customers would refuse an alternative and that's how they would know who was addicted. "This was somehow our regulation at the coast - however keep in mind that prior to that, they could buy at all seven pharmacies in Walvis Bay and go unnoticed." He added that their control of the situation at the coast was more manageable as Walvis Bay only has seven pharmacies. "Now imagine in a town like Windhoek - how does one keep close tabs on codeine abuse with so many pharmacies?" Narraville Neighbourhood Watch member, Charles Neidel, also told New Era that codeine addiction is rife at the coast and is more common among teenagers. "We confiscate a lot of cough syrups containing codeine on a daily basis while patrolling Walvis Bay. Sadly there was nothing we could do in the past apart from taking the addictive syrups from them." He says codeine addiction is a reality and cannot be ignored. "It should be addressed before it gets out of control. Our hopes are that the recently issued regulations from the ministry would control it, otherwise our children are at danger," he said.